Exterior of the Quarantine Zone. Interior of the Quarantine Zone. 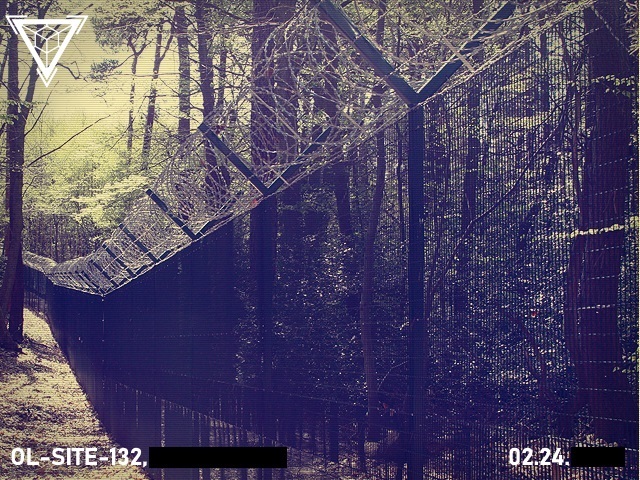 Containment Protocols: Perimeter walls that measures 5.9 meters tall and 1.8 deep in the ground, along with electrical barbed wires were constructed around the Quarantine Zone of OL-Site-132, as to contain and prevent instances of RPC-382 from escaping. Due to the unavailable to transport the instances of RPC-382, OL-Site-132 was retrofitted with a permanent research facility outside of the Quarantine Zone. Any suspicious activity observed within the Quarantine Zone are to be reported to security personnel immediately. By no means should onsite personnel enter the Quarantine Zone without the approval of the Director of OL-Site-132. However, upon approval, personnel are to be accompanied by four security personnel, and wear a Level B hazardous material protection suit as the Quarantine's atmosphere is environmentally contaminated with high levels of cyanogen chloride (See Addendum 382.01). 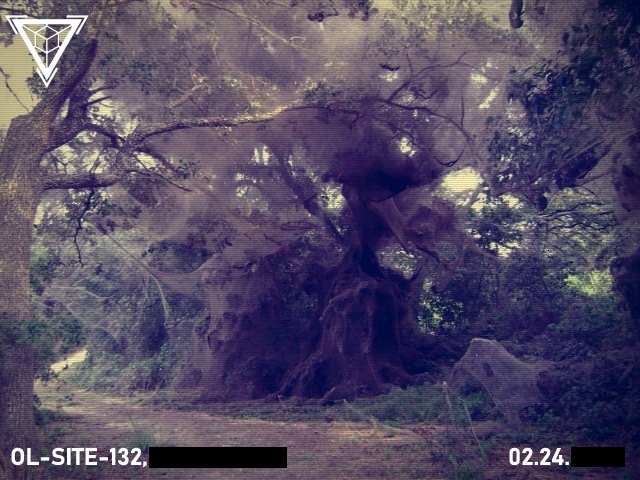 Progressing further into the ecological habitat of the instances of RPC-382 is strictly prohibited. In the event of a containment breach, all instances of RPC-382 that are attempting to breakout of the Quarantine Zone are to be immediately terminated on sight. Description: RPC-382 refers to a species of sentient organisms that resemble the spider species of Lycosa Tarantula, but are different in terms of size towards their counterpart, which a matured instance can be measured at 2.48 meters tall and weighing at approximately 975 kilograms. RPC-382-1 refers to a larger sentient than RPC-382 instances that have been identified to act as a principal leader towards the RPC-382 instances, which is lighten by the fact that RPC-382-1 appears differently as it has a larger abdomen; six white eyes; and appearing to be accompanied by six instances of RPC-382 that have also been observed to act as a security guards towards RPC-382-1. However, information regarding RPC-382-1 is currently unavailable as previous attempts to attempts to main visual contact have been unsuccessful, and the latest visual contact of RPC-382-1 was in [DATA EXPUNGED]. The ecological habitats found within the Quarantine Zone are built and hosted by RPC-382, and are widely believed to be massive habitats for incubation of captured and injected subjects. Under the orders of the Director of OL-Site-132, along with the approval of the Global Directors, the termination of these ecological habitats are to be operated once per month as a means to control the rapid population increase of RPC-382. Discovery: In ██/██/██, the National Aeronautics and Space Administration (NASA) was monitoring an unidentified object that had passed through Kepler-186f as it drifted off course at an accelerating rate, which was estimated to be traveling at the cruising speed of [DATA EXPUNGED]. By the ██rd, the unidentified object had collided with a military satellite upon entering the Earth's orbit, and crashing onto a nearby isolated town in ██████████, Arizona, USA. Following the object's initial crash in Arizona, a U.S Army detachment was dispatched to investigate and contain the crash site, and established a military exclusion zone around the vicinity of the crash site. A decontamination center was also established due to environmental concerns of extraterrestrial bacteria, or other organisms that may threaten the Earth's biosphere. During the initial phase of decontamination, communications with onsite military personnel failed to report back prior to their check-in three hours ago. Eighteen hours later, the military exclusion zone had gone silent, along with the nearby town of ██████████, Arizona. The U.S Army had then expanded the perimeter of the military exclusion zone into a five mile radius, and redesignated the area as the Quarantine Zone. Due to the unsuccessful attempts to maintain security and communications within the Quarantine Zone the Authority was shortly contacted, and had immediately took over onsite operations. Addendum 382.01: Environment Report of the Quarantine Zone. The Quarantine Zone had been analyzed by onsite environmental specialists, and discovered that the atmospheric levels contained high concentrated levels of cynaogen chloride. It's currently unknown to how the atmospheric levels were altered, but it has been theorized that the crashed object within the military exclusion zone had released some sort of chemicals that merged with other chemicals, such as sodium cyanide, to form cyanogen chloride. With concerns of these atmospheric levels spreading outside by onsite management, a controlled ventilation system was constructed to control the atmospheric levels that entered and exited out of the Quarantine Zone. Addendum 382.02: Transcript of Neurotoxins Experiment. On ██/██/██, Dr. Rieper was supervising the experiments of the neurotoxins sample that was taken from a captured specimen from the Quarantine Zone. An ASF Team, equipped with Flamethrowers, were standing by outside of the testing chamber for the termination of CSD-24738. Note(s): The experiment was to observe the administer, and the biological side effects of the neurotoxins reacting within the human body. Dr. Rieper: CSD-24738, please state your current condition. CSD-24738: Uh no 'doc? I am perfectly fine, and when am I exactly getting out? Dr. Rieper: You'll be removed from the chambers as soon as we concluded with the experiments, CSD-24738. CSD-24738 has been observed to be erratic upon itching onto their injection mark for approximately around eight to fifteen minutes, prior to their injection four hours and twenty-three minutes ago. Dr. Rieper: CSD-24738? How are you exactly feeling over there? CSD-24738: (The audio can slightly pick up CSD-24738's low grunt as they continuously scratch onto his injection mark.) I am feeling really itchy 'doc! It's like I'm actually burning up here! Can I get some medical attention? Dr. Rieper: I'll consider it, in the mean time, I highly recommend you stop itching and touching that injection mark. Otherwise, it'll end up worse. CSD-24738 was painfully breathing as he layed onto the ground, appearing as if he was about to vomit onto the floor. Dr. Rieper: CSD-24738? I need an update. CSD-24738: I'm feeling nauseated, can I seriously get a medical attention? Please?! (CSD-24738 is seen coughing out blood as he complains about their current condition. Dr. Rieper: Understood, but before we can do that, can you take off your shirt immediately?Before we can do that CSD-24738, I need you to take off your shirt immediately. CSD-24738 is then seen standing up and removing their shirt, but upon removing their shirt, bulging boils appeared around their torso; arms; and; even their neck. Dr. Rieper: I see. Now, your request for medical attention will arrive within a few hours. CSD-24738: A few hours?! But I am feeling that I am going to bleed out 'doc! Dr. Rieper: CSD-24738, I understand, but, it's either that or there will be no medical team coming up. Note: Dr. Rieper had never ordered any such medical team to the test chambers. CSD-24738 is observed to continuously vomit blood on the floor, and bangs against the containment door as they pleads for help. Within three minutes, they collapsed onto the floor and unresponsive. CSD-24738 began to scream loudly as he uncontrollably shakes on the floor. He continues to scream for about two minutes, and slowly, the bulging boils begin to burst open within CSD-24738. The hatched instances of RPC-382 began to [DATA EXPUNGED]. The ASF Team was given the orders to enter into the chambers, and immediately terminate the instances of RPC-382. 1. Instances of RPC-382 are confirmed to have no specified gender, thus are classified as an asexual entities that do not involve the fusion of gametes. 2. Research regarding the usage of RPC-382's webbings as means of using it as an experimental armor is currently under consideration by the Assistant Director of the Research Department.